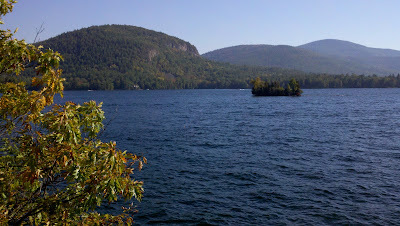 Lake George in the Adirondack Park in New York is just a spectacular place. With the best weather of the year lasting all weekend, the lake was calling out to us. Motor boat traffic was pretty light, making it an even better day to paddle. Leesa and I launched about 12:30 from the Northwest Bay parking lot on Route 9, a couple miles north of the Town of Bolton Landing. 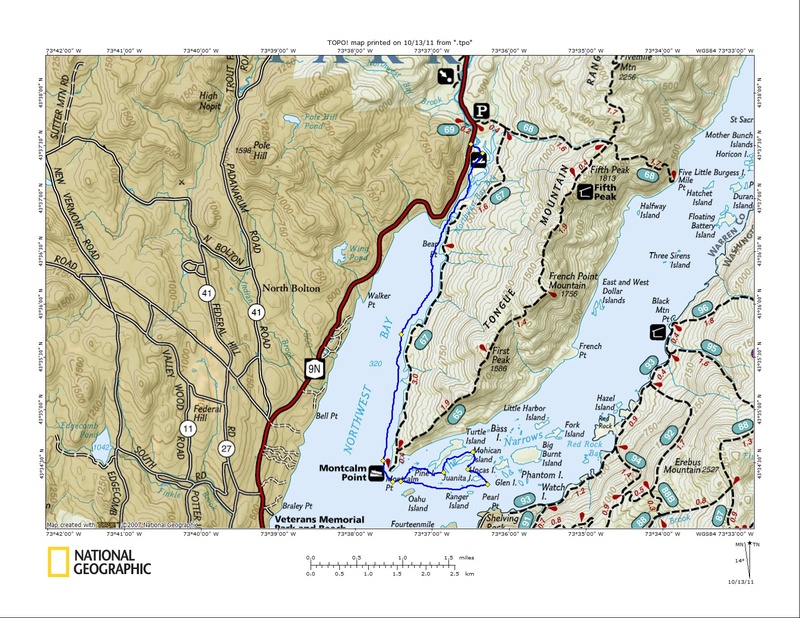 Our route consisted of paddling south on the Northwest Bay Brook to where it entered the bay, then continuing south on the east side of the bay along the Tongue Mountain range to Montcalm Point at the tip of the range. We then rounded the point and entered the Narrows, where we paddled past Pine Island before landing on Turtle Island for a break. The docks have already been pulled in on many of the islands including Turtle. 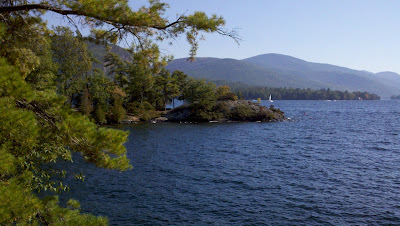 We noted that campsite 33 on the SE corner of the island has an especially good spot with a nice rock outcropping on which to sit and view the lake. We then continued into the middle of the narrows, circling around Juanita Island before returning the way we came. We paddled a leisurely 12 miles total and returned to the parking lot around 6 PM. Site 33 on Turtle Island gets the rocky point! Our route made a great half day paddle. Lake George has crystal clear water. The water temp. was down to 62 degrees, so no swimming, but nice none-the-less. Lake George is so special to our hearts. NW Bay is a one of my favorite places on the Lake, so peaceful and a world almost by itself. Did you hear any frogs while in NE Bay? We have heard Bull Frogs there in the summer. We have also spotted great blue herons which were a treat to see. Can't wait to go back for vacation in July. We didn't see much wildlife on that paddle, but I imagine there are lots of birds and herons in the back bay inlet stream. I did "bump" into a former neighbor while paddling though. That was nice. Great post! I was thinking of launching my Hobie catamaran out of Northwest Bay Brook. Do you think this is feasible? The cat is 13ft long 8ft wide and about 200lbs (one person carrying on each side). Is the launch straightforward from the parking area or do you have to cut through any trees, tight spots, etc. Any help would be greatly appreciated! Thanks! The launch is straight forward. I don't think trees would be a problem. It is very shallow for a short distance and meanders for a little while. Good luck, and thanks for reading.